Oxygen Treatment is one of the most essential elements for human life. The oxygen that we inhale from the air around us helps keep our body and skin free from impurities and toxins. But as we grow older, the oxygen levels in our skin naturally decline, which contributes to wrinkles and fine lines. Enter the oxygen facial. This specialized beauty treatment is designed to replenish the levels of oxygen in your skin, smoothing out wrinkles and restoring a youthful appearance to your face. 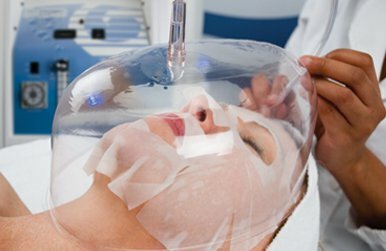 Several celebrities tout the amazing benefits of oxygen facials. "Kate Middleton is rumored to have had an oxygen facial before the royal wedding." What exactly is an oxygen facial and what makes them so beneficial? Oxygen provides life and energy to every living cell in our bodies. Our ability to think and act comes from the energy created by oxygen. It’s also one of the most important elements for the prevention of disease, and is absolutely essential to optimal cell function. From an aesthetics point of view, measurable oxygen levels begin dropping in the skin at the age of 25 and extremely low oxygen levels are strong indicators of aged skin. By age 40, 50% of the skins ability to consume and retain oxygen has been impaired. When the skin is deprived of oxygen, blood vessels constrict and it severely compromises the skins ability to function properly. Dry, dull looking skin can add years to appearance and may not respond to your usual skincare or makeup routine. If you’re not getting enough sleep, are undergoing extreme stress, or even experiencing hormonal shifts, the effects can quickly show up on your skin. Toxins from the environment and an unhealthy diet can further compound the effects, making skin look far from healthy. If you have never tried oxygen facial therapy it is a MUST and you will feel and notice the difference in the very first service! • Oxygen facial therapy is applied in a multitude of ways, via domes, jets, wands. What to Expect: Each service begins with a comprehensive skin analysis which ensures a complete focus on your concerns and objectives and allows the development of an in depth service plan. From this analysis, we will create a highly specialized facial service for you utilizing the most powerful and proven ingredients used specifically in conjunction with Oxygen. Pure Oxygen is utilized on the skin for minimum 40 minutes. Oxygen Facials are available for: Anyone and Everyone – an amazing facial for fine lines/wrinkles, dryness, acne (a must!) and all things anti-ageing!